I discovered fresh cheese for myself, I ate similar spread before but the fresh cheese consists of much less fat. Last week I found one with 5% fat content and that alone would be much less fat than a low-fat margarine has. I saw a wraps recipe where fresh cheese with 0.4% fat was mentioned and that’s how I got into this. The lowest I could find in my favorite grocery store was 0.8% and I purchased this one regularly this week. Of course, that’s no real alternative to low-fat margarine in every case, because I wouldn’t eat meat with fresh cheese on bread. However, it’s very tasty with salad, especially with tomatoes. 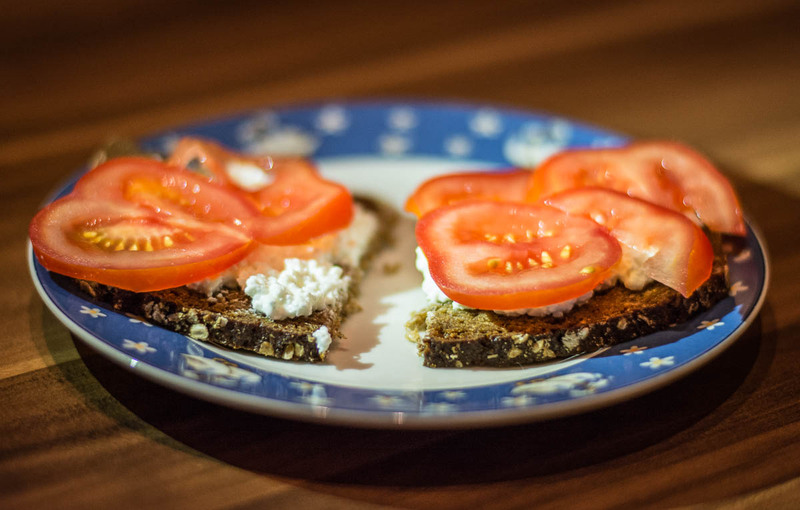 Fresh cheese on black granary bread with slices of tomatoes, that’s for example really delicious. With the low-fat content of 0.8% you don’t really notice too much of the cheese, but the bread will taste less dry. So, this is a nice evening meal with low-calories. I still like to eat cold cuts, but recently I started to eat more poultry cold cuts than other sorts of meat. I still have my days where I don’t care what I eat, because as mentioned in previous related posts, I want to enjoy life. But when I did sports, I prefer lighter meals and it shows results. I think jogging introduces me into some healthy habits or it does at least make me look a bit more at what I do eat in the week. I think there are also people who would say that bread is a no-go because of the carbohydrates, but I don’t want to be on a low-carb diet, because I don’t care about all this non-sense at all. I just want to try out different eating habits, while still having days in between where I simply don’t care at all about all this. I still like some hefty meals and I can compensate it with the running, but sometimes I just like a light meal after the running. I must say I found some really interesting low-carb recipes. The wraps recipe for example was very interesting, but I would only try it out because it looks delicious, not to start a low-carb diet. I find this so stupid, I just saw one guy in a TV documentary who would check his blood each morning to find out if he is on ketosis and if his low-carb habits work out. Should I be honest? I would kill myself if that would be my life. It seems you can find extremists in every aspects of life. What I didn’t do before was taking a closer look at my eating habits. Since I do this, I do for example eat more fruits because previously I just ate vegetables. That’s just one example, but what I mean is that I want to balance my nutrition a bit more without becoming a health guru. Hell no, if my brain tells me that I should consume french fries with mayonnaise and curry sausage today, I will not wait a second and fulfill the wish. that looks amazing! can you tell me what “fresh cheese” would be called in USA? Is it cottage cheese? I am vegetarian and always looking for protein alternatives. It is most difficult for me to stay low carbs, because I CRAVE them, but trying cuz Doc says Im insulin resistant! Great food pic too!! Like the post about rainy days… the smell of wet grass and damp atmosphere is so welcoming after hot dry spells of weather. I love walking in the rain… never take a brolly with me anywhere, it has been known for me to dance in the rain.